This academic year we are reflecting on the student experience of different generations of alumni and current students. This month’s Mission Matters focuses on ‘the ICC student experience’ in the late 1950s. The details of the case were not difficult to determine. A pair of sophomores (Dan Otto ’62 and Larry Miller ’62) had organized a prank with help from some friends. The pranksters sent various people on campus a written note that they were going to burn down “The Barn” – the old gymnasium built in 1921 that badly needed to be replaced. When President Esch learned about this “threat,” he sent word around campus that this was a serious matter. Shortly thereafter, the two first-year students went to the president’s home (at 2 a.m.) and confessed. As it happened, I had recently heard the story from Dan Otto’s perspective about how relieved he and Larry were to be sentenced by the student court to “community service” on campus as opposed to being expelled. Bob explained: “there is more to the story than what you have been told.” This was one of the first cases of the recently formed student court, on which they both served. Bob, who had been the president of the court, described the process of adjudication as he remembered it. This occurred as the college’s leadership began taking steps toward giving student leaders more responsibility for administering discipline. In retrospect, it was one significant step in the process of shift in away from the in loco parentis philosophy of student development. The conversation continued. As I recall, Carolyn asked a question to clarify the outcome of the case. I described the version that I had heard from Dan Motto. Gene, who had been mulling the matter over, suggested a slight modification to that account. Bob listened thoughtfully, offered his sense of the matter, but also acknowledged that Gene might be right. After all, the memories in question went back almost six decades, and even in 1959 there were disagreements about what transpired. We all chuckled as we strolled into UIndy Hall where the Donor Scholar Luncheon was about to begin. 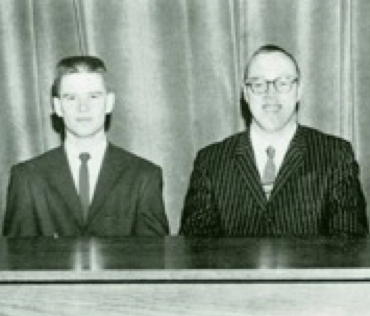 Bob Frey (right) and Gene Lausch (left) on the Student Court in 1959 (photo from 1959 Oracle yearbook). I remember thinking to myself that versions of this alumni conversation had occurred on other occasions. Not unlike the congenial way friends might trade observations as they appreciate a very good bottle of wine or a fine cup of coffee or tea. We are talking about the kind of enjoyment that arises from cherished friendship built around shared affections, the kind of dedicated love that we associate with that older sense of the word “amateur.” Alumni love their alma maters. They don’t necessarily want to analyze it like someone might look at a specimen under a microscope. The former can sometimes be protective of their heritage against the critical scrutiny of the trained historian. Robert Frey Ph.D managed to do both without confusing the two, which makes him unusual in today’s world. From these three paragraphs, readers can easily detect Frey’s capacious memory, punctuated with detailed observations about the student experience on this campus in the late 1950s. In the paragraphs that follow, he describes his first days at Indiana Central, how he met lifelong friends such as Gene Lausch (who lived in the same dormitory) and Carolyn France (who was assigned to sit next to Bob at the required chapel sessions three times a week). In chapter five, Frey offers a detailed account of his first week at ICC, which included an outdoor matriculation ceremony that conveyed that “we were moving into a new world,” where the “laws of the campus” included a prohibition on the consumption of alcohol as well as prescribed dress for various occasions. In the following paragraph, Frey recalled the social mores as they informed the schedule of the week. Part of the culture of Indiana Central then – as now at UIndy – was the way that students interacted with faculty. By the end of Freshman Orientation, Bob had met with his advisor, Dr. Kenneth St. Clair, who was the Chair of the History Department. As a pre-law major, Bob chose to major in history instead of pursuing the 3-3 cooperative law program with Indiana University School of Law. Prof. St. Clair was the person who had the greatest impact of Frey’s intellectual development during his college years. Frey also describes his encounters with professors who he found to be difficult. He had great respect for Prof. Sybil Weaver who taught English. He had no particular difficulty in her classes, but he struggled through the study of German under Prof. Marga Meier. Oddly enough, he scored high enough on a standardized test after one year to complete the foreign language competency requirement that was a feature of the liberal arts curriculum while he was a student. Frey was not always happy at ICC. In fact, during his sophomore year, he actively considered leaving ICC. In part, this was due to the fact that he felt like an outsider. Despite the fact that he had various connections with members of the faculty, he did not think of himself as a Hoosier. Used to having his own room at home, Bob preferred to have a zone of privacy. Frey describes a couple of incidents in which his assumptions about personal property (e.g. the use of his typewriter) clashed with the cultural expectations of fellow residents in his dormitory. Eventually, Bob “tried to fit into the Indiana ‘what’s mine is yours’ culture’ but in doing so he would struggle such with the loss of his baseball catcher’s mitt after lending it out to a guy he barely knew. In part because of these clashes of sensibility and culture, Frey often thought about transferring to one of the other EUB church-related colleges such as Albright College or North Central College. In the end, he decided to stay at Indiana Central. Several factors played into the decision, including the development of friendships with fellow students, his budding intellect in the context of relationships with Indiana Central faculty. In retrospect, he thinks the period of six weeks that he and his family spent working with Hispanic children and families in New Mexico after his sophomore year was an important intercultural opportunity. 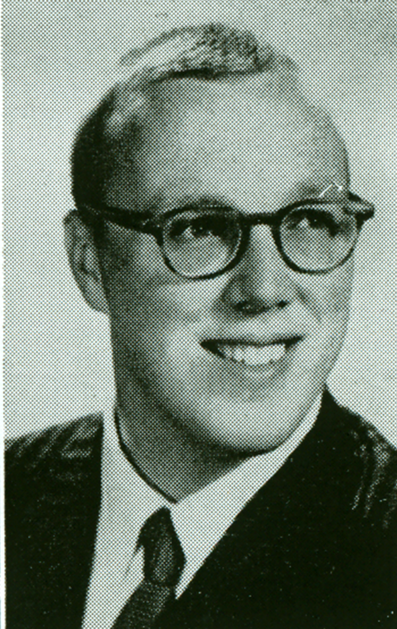 At the encouragement of his friend Gene Lausch, Bob joined the debate team at ICC. The pair teamed up for the greater part of three years, an experience that provided the opportunity for him to develop a sense of competence as well as to discover his talents. The epic road trip that Gene Lausch and Frey made during their senior year was another favorite memory that he recounts in chapter six of his autobiography. Bob ran for president of the Student Council. He didn’t win, but he enjoyed the experience. He regarded the fellow who won that election, Ron Howard, as another lifelong friend. Bob’s self-deprecating joke makes sense to anyone who knows that stories of higher education always have a teleological sequence – a before as well as a during in route to the end – defined by the ceremonies of matriculation and graduation. And Frey would remind us that the part of the story that comes “after” is also very important for how we remember the “before” and “during” parts of the tale. He knew well that the transformation of lives in the journey that we know as higher education is a marvelous mystery that includes unexpected detours as well as patterns aren’t always immediately obvious. Robert Frey became a college professor; he taught history to undergraduates in Virginia, Ohio and West Virginia. 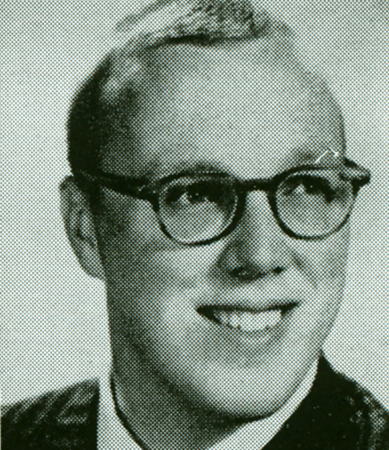 Just as there is more to the story of the prank that led to the two freshmen being brought to the Judicial Council where upperclassman Bob Frey and Gene Lausch along with three other peers determined what discipline to recommend to President Esch, there is more to the story of Bob Frey’s student experience during the late 1950s. For those who have the time and interest, I encourage you to read more from that the two chapters from Frey’s autobiography that are now available through the Frederick D. Hill Archives at Krannert Memorial Library. 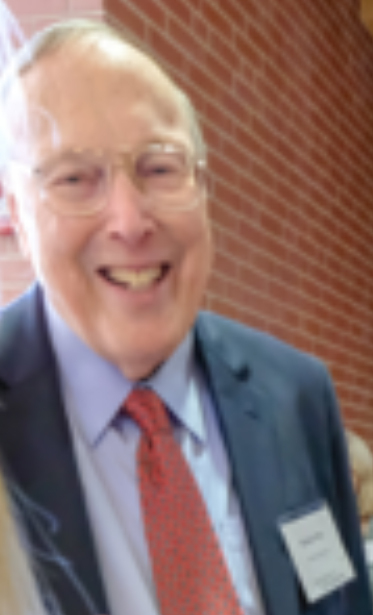 Meanwhile, those of us who gather for the 2019 Donor-Scholar Luncheon will miss Bob’s genial laugh. If Gene Lausch ’60 and Carolyn France Lausch ’60 are present, I am sure they will join me in cherishing the memory of their dear friend and classmate Bob. We will savor the memories we share like some folks might enjoy fine wine. In the next Mission Matters piece, I will provide an overview of Bob Frey’s subsequent graduate study and professional achievements as an historian and college dean in the context of describing how his life reflects the mission of our university and Mission Matters #52 will focus on Bob Frey’s final reflections about “What Can History Teach Us?” – an article that offered a retrospective about United Brethren and Evangelical Church splits of the 19th and 20th centuries for readers to consider as the 2019 General Conference of the United Methodist Church draws near. As always, I invite your feedback at missionmatters@uindy.edu. In the meantime, thanks for taking the time to reflect with me.